Das Digital Real Estate Ökosystem 2019 umfasst 230 PropTech Startups n sowie 42 Immobilienportale/Marktplätze, 16 Datenanbieter, 14 Datenraumanbieter und 3 Incubator/Accelerator sowie 6 spezifische PropTech Investoren. drooms, architrave, evana, docunite, netfiles, awaro, thinkproject, docurex, brainloop, pmg, rethinklegal, teamproQ, conclude, datengut. salz&brot, mcmakler, realbest, immomio, wohnungshelden, meinemietkaution, wenigermiete, maklaro, faceyourbase, hausgold, moovin, deskimmo, wunderagent, myrealid, realpocket, homeday, housy, immobroke, immo-corporation devepo, maklerempfehlung, immoinsights, immoverkauf24, mieterengel, opportunityfinder, immoanteil24. go-popup, brickspaces, bee.hive, setting, sharednc, bespaced, store2be, rent24, homelike, medici living, intertempi, homefully, wg-suche, nestpick, tauschwohnung, acomodeo, wunderflats, shareallspace, yoloco, tempoflat, senioren-wg-finden, allofficecenters, homesharing service, spacebase, uniplaces. navvis, archilogic, immomento, begehungen.de, vuframe, echzeit.de, immzeit, wegzwei, vrnow, freeforma, airteam, bee2b, redline 3d, allvr, ar-check, halu, reflekt, viality, fairfleet, q-kie, planery, immoviewer, innoactive, voxelgrid, vr-immersive, showit360, enscape, ogulo, build.architecture, lookaround, inreal tech, visualix, holodeckvr, revvis. building radar, sablono, planradar, baudetail, capmo, bimwelt systems, diplan, caala, coplannery, immosist, baumensch, bauhub, almondia, realpd, planstack, obob, molteo, alasco, 123erfasst, reinvent, sharemac, klarx, digiholz, popularc, plan1, plaans. exporo, brickvest, zinsland, ifunded, reacapital, immorocks, engel+völkers capital, mezzany, rendity, hypcloud, fundernation, immofunding, bergfürst, grundag, sarego, vestinas, today capital, homerocket, zinscrowd, immorocks, corefihub, brickblock, zinsbaustein, realisto, hypofriend. 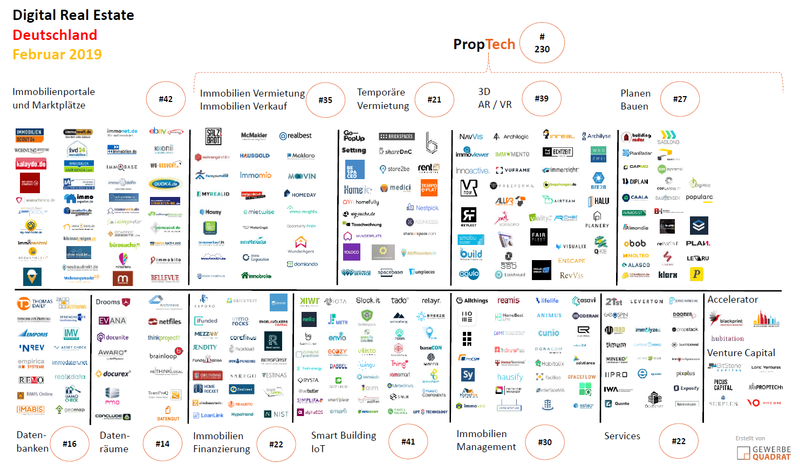 allthings, reamis, lifelife, casavi, homeht, homebeat.live, animus, moderan, propertymind, deutsche immobilien it, cunio, everreal, procsm, thesmarterplace, oracom, etg24, immoterminal, habitalix, solutiance, sykosch, simplifa, facilioo, homefox, eigenheim manager, quartiersapp, immoveo, vermietet.de, tower360, spaceflow, estao. Wir haben eine Firma vergessen? Einfach direkt kommentieren und den Link einfügen, vielen Dank – Wir freuen uns auf den Eintrag!